Process both flours, sugar, and salt in a food processor until combined. Add lard and pulse until mixture resembles coarse cornmeal, 5 to 6 times. Add butter and pulse 5 to 6 times, until it’s pea-size. Place in bowl, cover with plastic wrap, and chill 1 to 2 hours. Remove mixture from refrigerator. Gently toss mixture with a fork. Add the vinegar, then the water, a tablespoon at a time; mix just until dry ingredients are moistened and the dough comes together and forms a ball. Gently gather dough into 2 disks and wrap in plastic wrap. Chill for 1 to 2 hours. One a floured surface, using a floured rolling pin, roll 1 dough disk to 1/8 inch thickness (about 11 inches diameter). 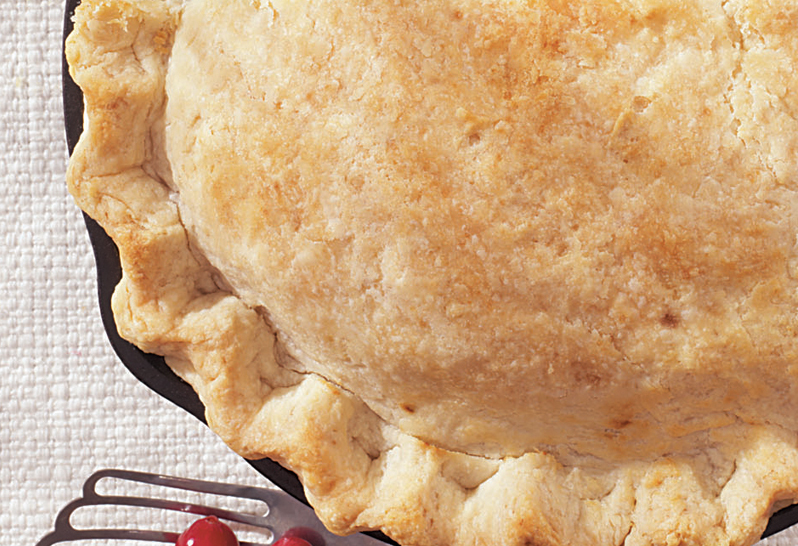 Gently press dough into a 10 inch cast iron skillet, allowing excess pastry to hang over edges. (Do not stretch dough or it will shrink during baking).